Thank you for the opportunity to testify today about college affordability in Pennsylvania. My name is Dr. Kenneth M. Mash, and I am the president of the Association of Pennsylvania State College and University Faculties (APSCUF). APSCUF represents about 5,500 faculty and coaches who work at Pennsylvania’s state-owned universities. Senators and representatives, we have a crisis in our Commonwealth. The 2011 cuts and the pre- and post-recession defunding of higher education in Pennsylvania are having horrible consequences, and this does not bode well for our collective future. We are denying the American Dream to too many, and we are acting irresponsibly by drowning a generation in a sea of debt. It begins with the underfunding of our public higher education, which leads to higher tuition and total college costs. Some just do not go; others take on ever increasing amounts of loans. The higher tuition and escalating total cost that result from underfunding have several concomitant but obvious results. Because costs continue to rise, enrollments decline at a rate that exceeds the drop in the number of college graduates. 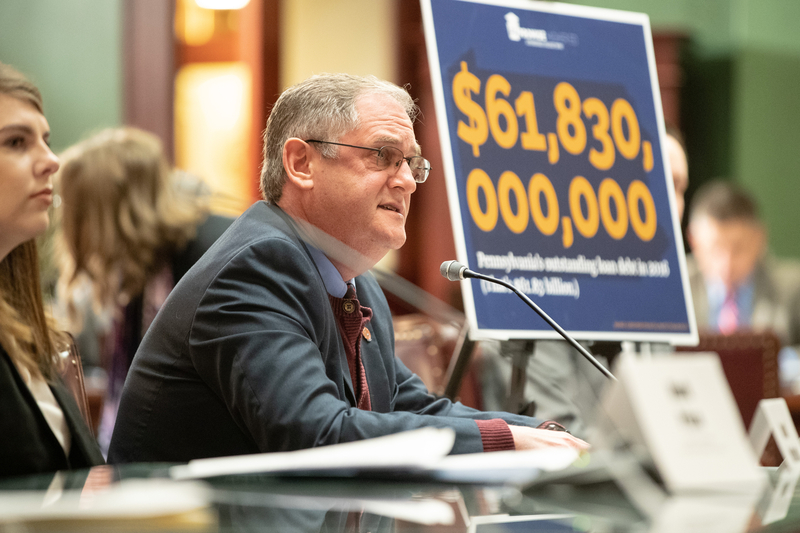 Because there are fewer students, fixed cost must be covered by fewer students, which requires additional tuition and fee increases, which leads to more debt. Because of the increased expense of public higher education, the private institutions become more competitive. They reach down to some of those who might otherwise attend a public institution by discounting their tuitions. They pay for this by increasing tuition for those in the middle class, which leads to additional tuition and additional debt. Meanwhile, we underfund PHEAA, which cannot keep up with the demand for grants, and that leads to more borrowing and more debt. Billions of dollars — nearly $62 billion — in outstanding student debt means that graduates cannot afford to buy homes or cars, and they will delay starting a family. What would happen to that debt if a major recession were to hit and there were major job losses? Money that would otherwise be added to the economy is instead paid in interest to lenders. Employers who may want to move to Pennsylvania opt to go elsewhere because too many just cannot afford to go to college. It all begins with the underfunding of the entirety of public higher education. Pennsylvania’s national standing with regard to public higher education continues to be an embarrassment, yet not doing anything substantial to fix the problem is the choice we have continually opted for. Make no mistake; as I reminded a public policy class last week, choosing to do nothing is a policy decision. Year after year, we fail future generations by pricing them out and saddling them with mountains of student-loan debt. And too many of policymakers throw up their hands as if there is nothing that can be done. The facts are startling. If the 2019 proposed state appropriation is approved, funding for Pennsylvania’s State System of Higher Education (PASSHE) will be similar what it was in 2005–06. When discussing affordability with some of our policymakers, I am often shocked that they will project their college experiences onto today’s students. There is simply no comparison. There is a direct correlation between state funding and tuition rates. In 1991–92, the state accounted for 55 percent of the cost for a full-time student (FTE). Since 2003, this percentage has steadily declined, and as of 2017 the state accounted for only 27 percent of funding per FTE. And that number has continued to shrink. Please let that sink in because it has been a policy choice. This Commonwealth decided that students should be pick up 73 percent of the cost, and now more. It is incomprehensible that Pennsylvania ranks 48th in educational appropriations per full-time student. But we are. Our funding is $3,521 below the national average per full-time student. To put that in perspective, PASSHE’s chancellor last week said that if we increased funding to simply the national average, the 14 PASSHE universities could lower tuition by 22 percent. For students from working-class families, that would be a game-changer. In 2013, a Maguire Associates study conducted for the State System examined the potential impact of increased costs on enrollment at state-owned universities, and it concluded that an increase of more than $3,000 in total college costs (tuition, fees, room and board costs, etc.) would lead to drastic reductions in enrollment. Moreover, the effects would be felt the worst at the five most cost-sensitive universities: Cheyney, Mansfield, Clarion, Edinboro, and California universities. It is not a coincidence that, years later, those five universities — having surpassed the $3,000 increase — are the ones confronting difficulties. They are also universities serving communities that desperately need affordable, high-quality higher education. To keep things in perspective, it is interesting to see just how much our universities would be receiving if funding had kept up with inflation. Adjusting to 2019 dollars, the State System’s allocation $465.2 million would be $600 million. But today, we receive only $475 million. Our system is being starved, and the need to balance our books has seriously put our legislative mission — to provide an affordable, high-quality education — at risk. Study after study can be conducted, but it doesn’t change the reality. Our universities are underfunded. The fact that we are granting record numbers of degrees is a testament to all who work at our universities and our wonderful students. We continue to hear from some lawmakers that “back in their day” they were able to work a minimum-wage job in the summer to pay for their education. I worked my way through college, too. But what we did just does not add up for today’s students. According to the Keystone Research Center, if one attended one of our state-owned universities in the 1970s, they could work 5.5 summers at a minimum-wage job to pay off four years’ tuition. Today, a student working a minimum-wage job would have to work 18.5 summers! In its 2018 “Best States” report, U.S. New and World Report ranked Pennsylvania 50th for higher education. No lawmaker or resident of Pennsylvania should be proud of this ranking. 50th in the U.S. News. 51st in average student loan debt. 49th in student loan debt per capita. 49th in higher education support per capita. It’s an embarrassment. When we first started looking into college affordability, I was upset for our students. But as we delved further and further into the numbers, I became angry as a father and a Pennsylvanian. What are we doing to this generation of young people? During that policy class I taught last week, one of the students thanked me for being one of the few people over age 30 to care about the future of his generation. On his behalf, I want to thank you again for bringing attention to this issue. I would further like to thank those who support the Pennsylvania Promise, and those senators who have begun to tackle the problem of student debt. I look forward to the day when I can thank the governor and this legislature for finally tackling the problem of college affordability. APSCUF faculty and coaches believe higher education should be affordable, and we stand behind the Pennsylvania Promise plan to make it so. We’ll be rallying 11 a.m. Wednesday, March 27, at the Pennsylvania Capitol in Harrisburg, and we want you to stand with us. We’re offering complimentary transportation and lunch to State System students, faculty, and coaches who share our view that students who have the aptitude and desire to go to college shouldn’t be priced out of the opportunity. For information about rides to the rally, contact your university’s APSCUF chapter. 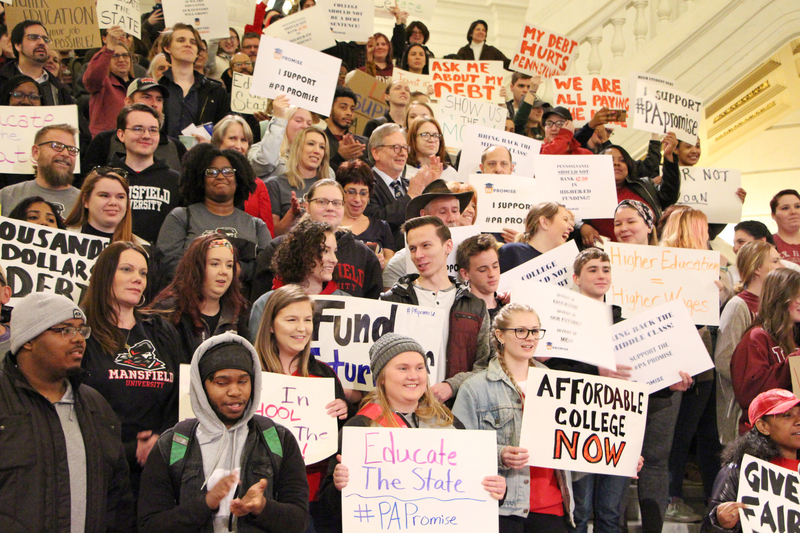 The Pennsylvania Promise would cover state-related and community-college students as well, and anyone who supports the cause — high school students, state-related or community-college students, parents, legislators, etc. — are welcome at the event. What should you bring to the rally? Your voice! A handmade sign would be fantastic, too. If you forget yours, we’ll have a few on hand that day. We’d also love for you to share your story in advance. Pennsylvania Promise will pass it along to Gov. Tom Wolf to encourage him to support the legislation already introduced in the House and Senate. Learn more about Pennsylvania Promise – Higher Ed and the bills at PApromise.org. Additional statistics are in this Pennsylvania Promise fact sheet. Before you board the bus, make sure you’re following Pennsylvania Promise on Facebook, Twitter, and Instagram. 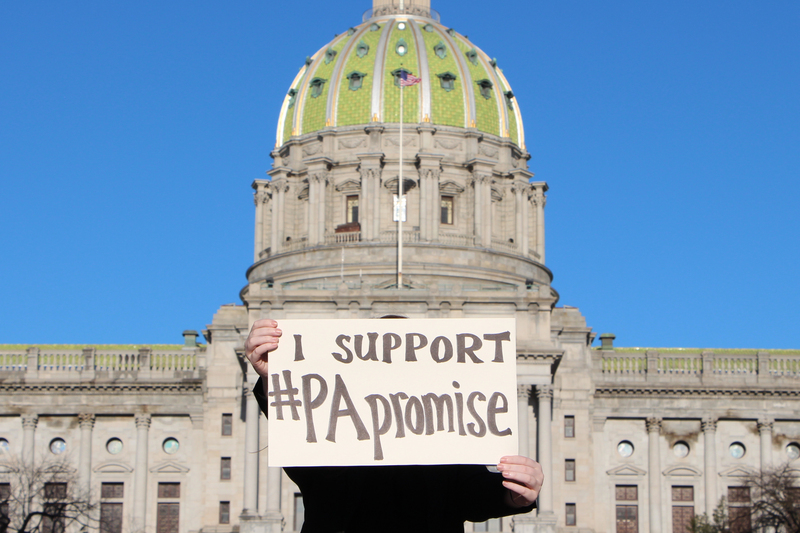 Share #PApromise posts and use that hashtag and #affordablecollegenow in your discussions to help spread the word. You can even add a PA Promise overlay to your Facebook profile photo by clicking here. The rally also will focus on student debt, and APSCUF supports legislation that eases the burden of student debt. Questions about the rally? Email Sean Crampsie at scrampsie@apscuf.org. 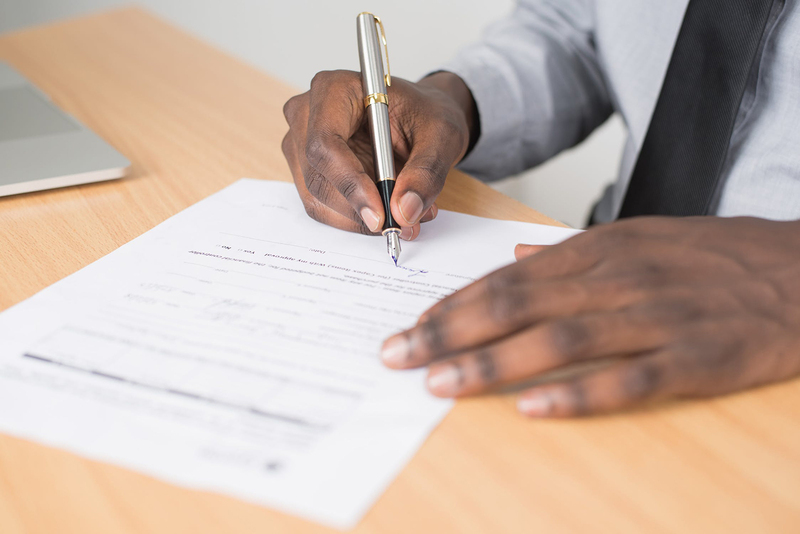 After changes with the Pennsylvania Faculty Health and Welfare Fund, plus general housekeeping in the new year, we’ve tidied and updated our forms-and-benefits page. This repository of forms for health, dental, vision, and more never requires a login, so you can access important information at any time. Click here to visit the forms-and-benefits page. Direct questions about benefits to Bim Arthun, membership-services specialist, at barthun@apscuf.org or 800-932-0587, ext. 3021.